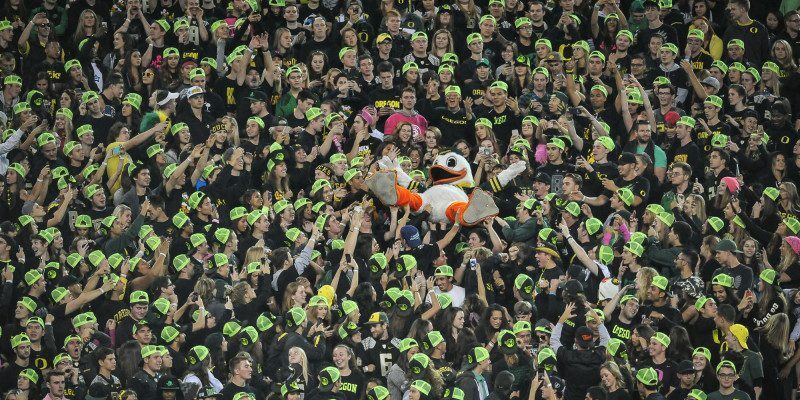 Looking at Oregon’s 2015 schedule most fans tend to only talk about Michigan State, Stanford, and USC. Yes, those are all very big games that will decide the fate of the 2015 Oregon Ducks, as well as the landscape of College Football. But there are other games Oregon fans need to be aware of, games that are very close to the caliber of those mentioned above, if not in the same category. 2014 Game Result: In 2014 when the Ducks traveled to Salt Lake City most fans knew what the Ducks were in for: four long, tough and physical quarters. The Ducks started slowly, as momentum swayed in favor of the Utes — until arguably the biggest blunder of the college football season unfolded: Kaelin Clay dropped the football a yard short of scoring a second Utes touchdown. Oregon’s Joe Walker recovered the fumble and ran 99 yards the other way to score, tying the game 7-7. 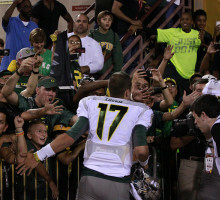 Clay’s blunder and the resulting 14-point swing easily changed the outcome of that game, but it also potentially changed the outcome of the 2014 season overall for Oregon. Oregon went on to win that game, scoring 24 points in the fourth quarter to beat Utah, 51-27. If Clay’s play had never happened and Oregon had lost to Utah, they most likely wouldn’t have been selected as one of the four teams in the college football playoff. Returning Starters: Utah is experienced. The Utes bring back an offense that will be run by senior quarterback Travis Wilson. With Wilson, the Utes have seven other returning starters. Along with the experience up front, another big piece of the offense is senior running back Devontae Booker; Booker rushed for more than 1500 yards in 2014. On defense, the Utes once again are bringing back experienced players, including seven returning starters. Those players all contributed to Utah’s stout defense a season ago, finishing the season with the Pac-12’s second best total defense, as well as leading the Pac-12 with a total of 55 sacks in 2014. 2015 Preview: I look for this game to be very competitive, not ending in the typical Oregon blowout. 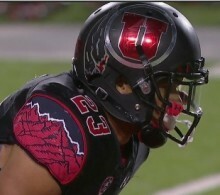 The key to this game will be the amount of pressure the interior of Utah’s defensive line can get on Oregon. Utah has been searching for that one big win each program needs to reach the next level, and the Utes certainly have a legitimate shot to get just that when they travel to Eugene in late September. 2012 Result: The last time Oregon played the Sun Devils was back in 2012, Todd Graham’s first season at the helm at Arizona State. It was a game that ASU made big for the student body, and for the change in culture at ASU. The game was played on Thursday night on ESPN. Unfortunately, all of the hype for the game didn’t affect the outcome, Oregon won that game handily 43-21. Jumping to 2015, the storyline seems to be about the same. The Ducks will travel to Tempe for a Thursday night tilt on ESPN, but this time they will be facing a team that now has four seasons under Graham and returns a lot of experienced talent from a season ago. Getting supporters, fans and students of ASU excited for this game won’t be hard. And the game is two days before Halloween. Could the Ducks be led by Jeff Lockie when they make their return to Tempe in late October? Returning Starters: Even though Arizona State’s quarterback Mike Bercovici wasn’t tabbed as the Week 1 starter last season, he still started 3 games when Taylor Kelly was injured. Bercovici has proven he can lead the offense, and has a ton of momentum going into the 2015 season. Along with Bercovici in the backfield is D.J. Foster, who rushed for more than 1000 yards in 2014. The experience at both quarterback and running back could be the duo ASU rides to the top of the Pac-12 South. 2015 Preview: I see this game as one of Oregon’s toughest road tests, against a team with experience at key positions such as quarterback, offensive line and the defensive secondary. Graham is still looking to take his team to new heights, and over the hump of second tier in the Pac-12 South to a legitimate contender. A week and a half to prepare for one of the most explosive offenses in the country could be a deciding factor in this game. The Sun Devils will have to improve from seventh place in both total offense and total defense from a season ago if they do indeed plan on making the leap to the top of the Pac-12 South in 2015. 2014 Game Recap: A game that the teams scored a combined 100 points, and more than 1100 yards in total offense. 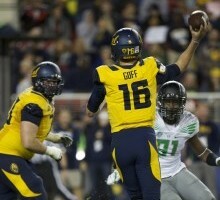 Cal put up a tough first half, trailing only by 10 at halftime, but in the second half Oregon cruised to a 59-41 win. Jared Goff returns as a 3rd-year starter at quarterback for Cal in 2015. Returning Starters: Cal brings back 17 starters from a season ago. Led by quarterback Jared Goff, Cal’s total offense was near the top in 2014 following only Oregon. The Bears will field a deep receiving core, and an offensive line that has been in Sonny Dykes‘ system since he took over in Berkeley. The defense is just as loaded with returners. Michael Barton returns as Cal’s most productive defensive player from 2014. Barton recorded 80 tackles and 1.5 sacks last season. 2015 Preview: The offense is not the concern, Cal’s offense can put up points quick. The offense averaged 38 points a game in 2014. The problems and questions surrounding the 2015 Cal team is their defense. Statistically last in total defense a season ago, the Bears gave up an average of 511 yards a game – 50 yards more than 11th place Colorado. Another glaring area of concern is Cal’s pass defense – last in the Pac-12 in 2014, giving up an average of 367 yards passing a game. In a league that is based on spreading teams out and scoring points quickly, Cal has the most work to do to improve. If Dykes can find a way to shore up the defense, and more specifically the secondary, Cal could be the dark-horse to come out of the North.